Bits and Pieces - Decorative Wally The Whale Ceramic Pitcher - Holds 24 ounces. 10'' tall Ceramic Animal Pitcher by Bits and Pieces at Wow In The Details. MPN: 30837. Hurry! Limited time offer. Offer valid only while supplies last. You'll smile with Wally as you serve your favorite beverages in our textured white whale pitcher. Holds 24 ounces. 10'' tall. Glazed inside and out. You'll smile with Wally as you serve your favorite beverages in our textured white whale pitcher. Holds 24 ounces. 10" tall. Glazed inside and out. 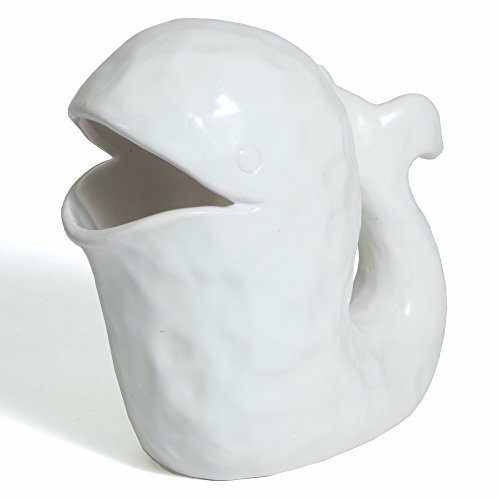 Hand wash.
You'll smile with Wally as you serve your favorite beverages in our textured white whale pitcher. Pitcher holds 24 ounces and is 10 inches tall. Do not put in the dishwasher (hand wash).